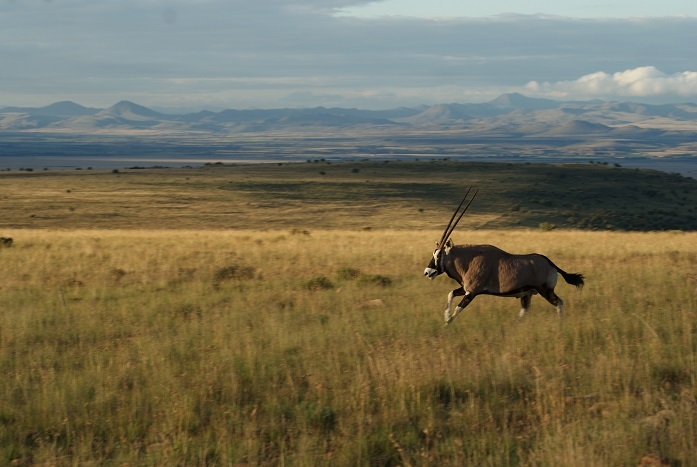 What would spring be without the appearance of baby birds, zebra foals and young antelope? 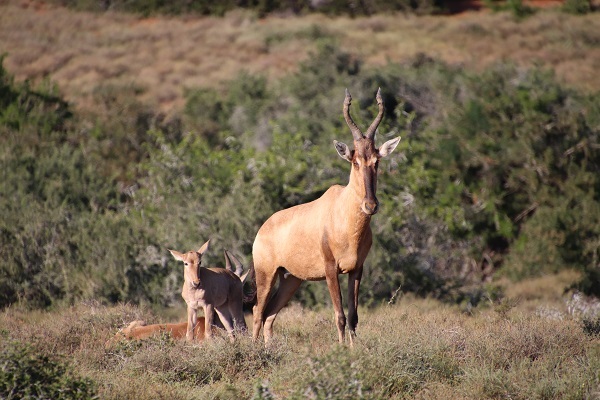 The Red Hartebeest (Alcelaphus buselaphus caama) in the Addo Elephant National Park seem to have enjoyed a successful breeding season. 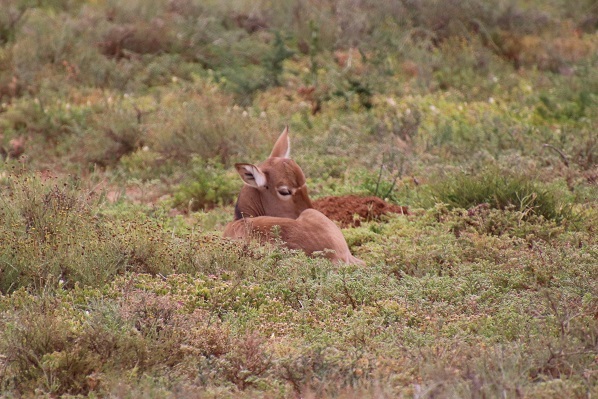 The calves, some only a few weeks old, are generally well camouflaged in the grass as they rest curled up near the adults. 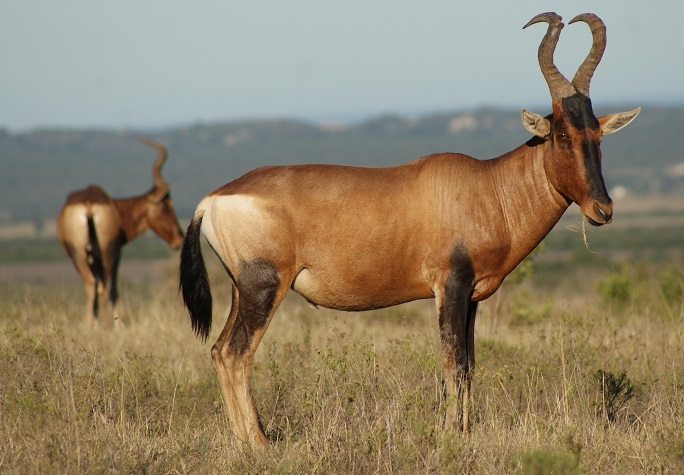 Red Hartebeest are grazers that prefer medium to long grass and so are clearly visible in the open grassy areas of the park, their bronze coats shining in the sun. 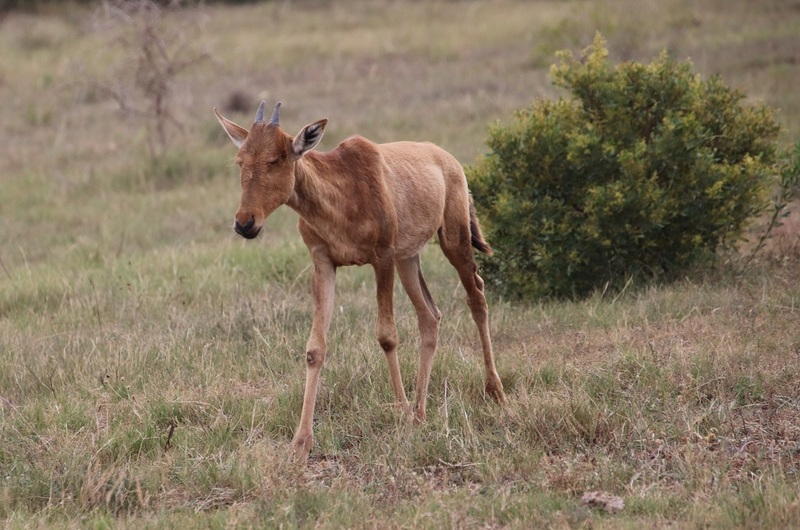 Although they are sociable animals, the breeding herds consist of cows and their calves – the cows give birth to single calves at the onset of the rainy season. 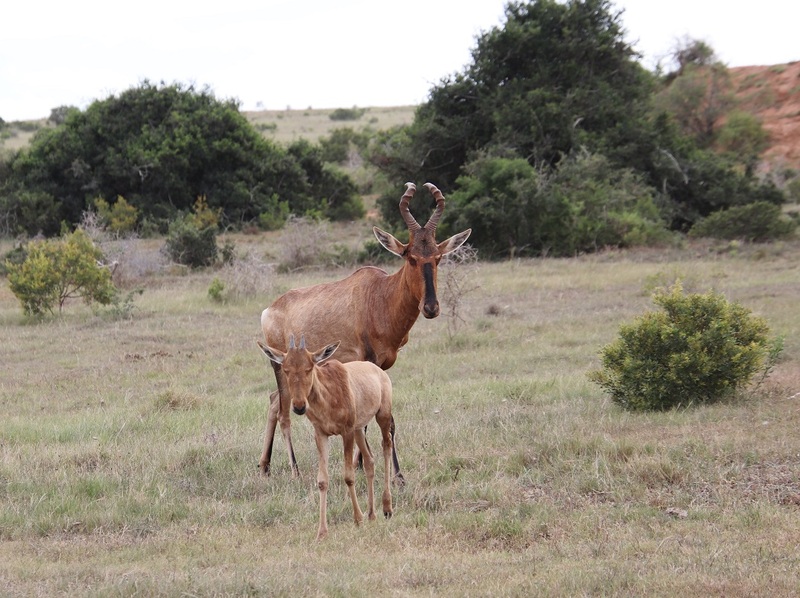 These remain well hidden for the first few days, joining other youngsters in their maternal herds once they are strong enough. 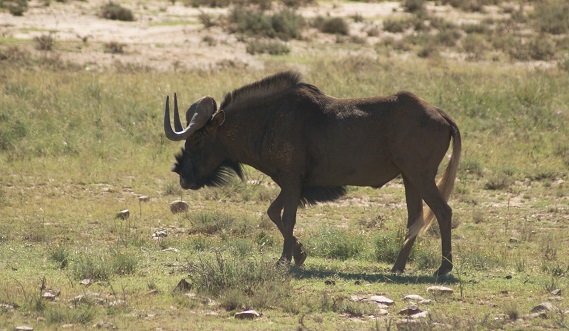 The dark tails of the animals, seen against the pale heart shape on the rumps of the adults, make them easy to follow. 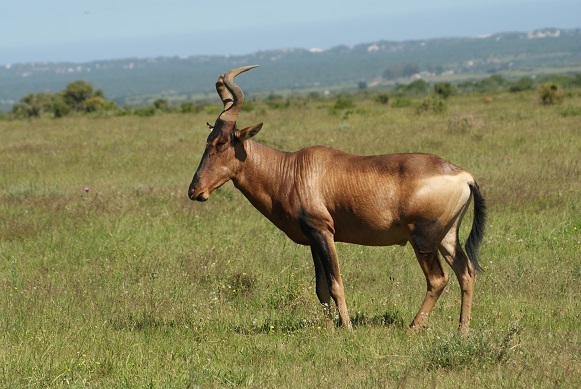 One cannot mistake the distinctive livery of the Red Hartebeest (Alcelaphus buselaphus) for their coats are a shiny reddish brown, with a distinctive white rump. 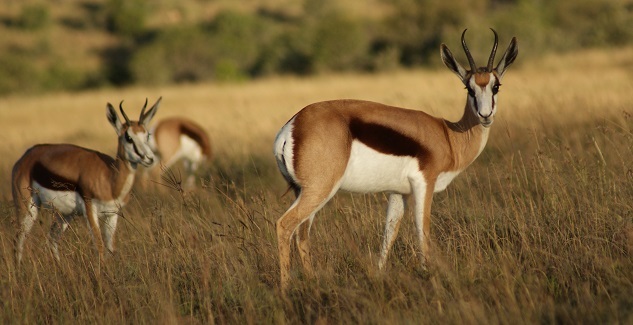 It is thought that these white rumps may help to reflect heat or, act as a warning or when the darker tail is moved across it. 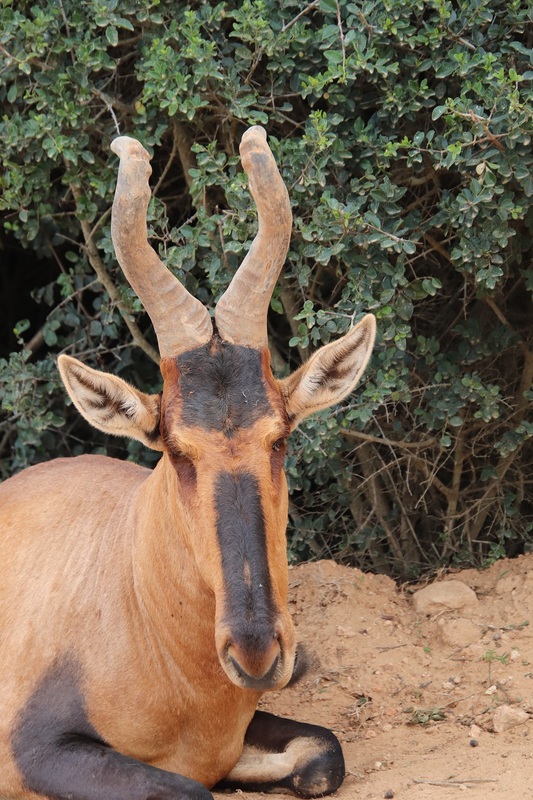 Notice the mud on the horns in the picture. 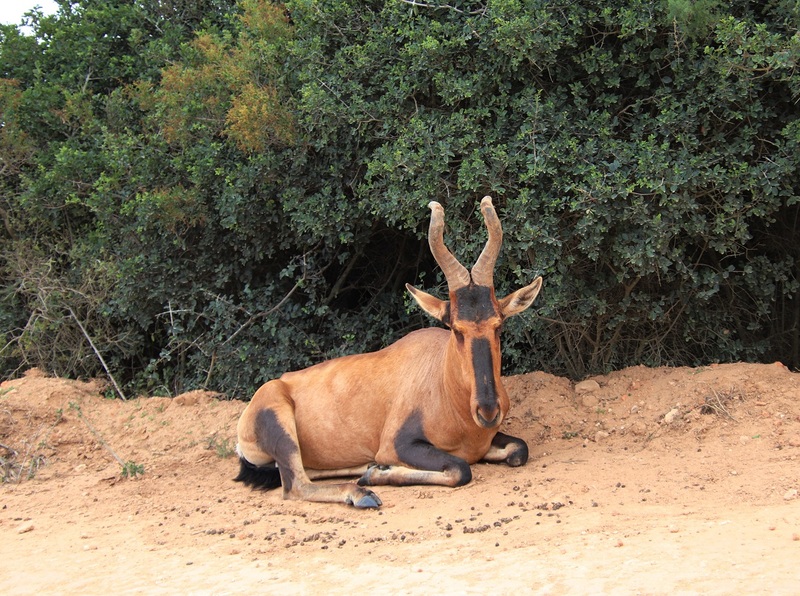 Both sexes have heavily ringed horns on a pedestal base and point backwards. 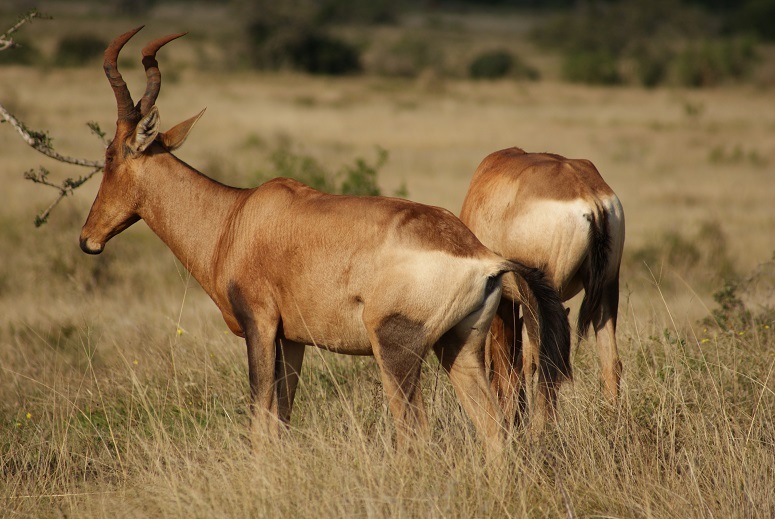 The Red Hartebeest have an interesting practice of covering their horns with mud, which may be a way of intimidating their rivals. 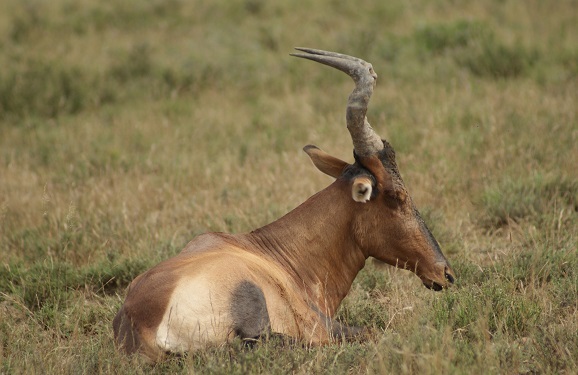 You can see a patch of mud still adhering to these horns. 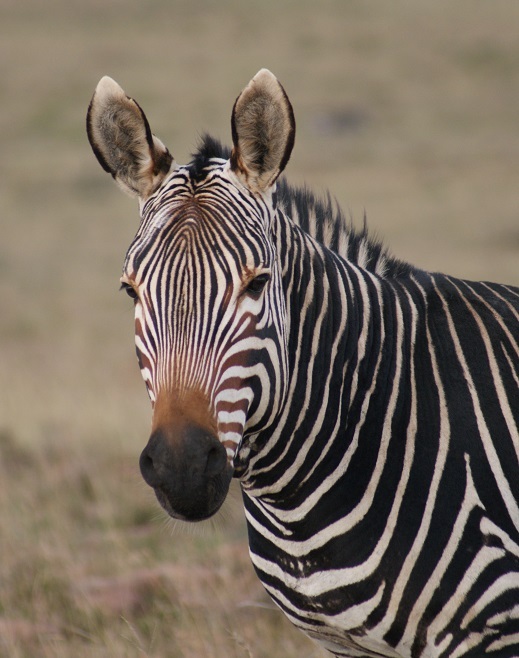 Dark areas stretch down from the shoulders to the hooves and the lateral sides of the front and hind limbs are mainly black. 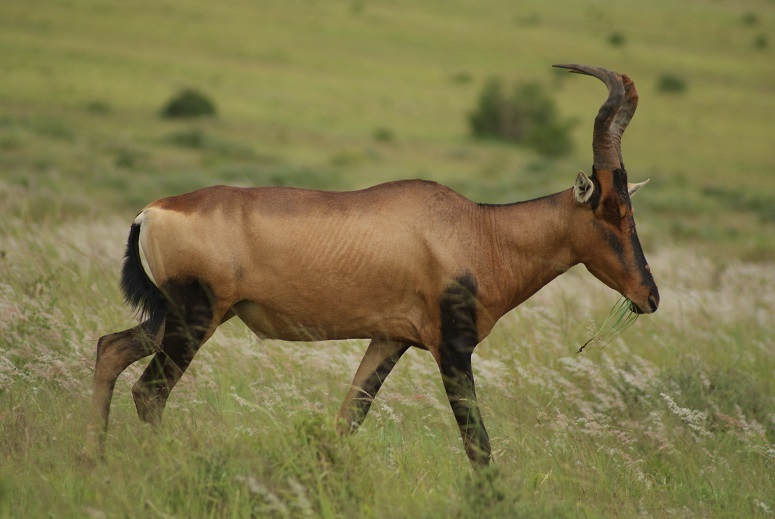 Note the black blaze on the face and the goat-like eyes. 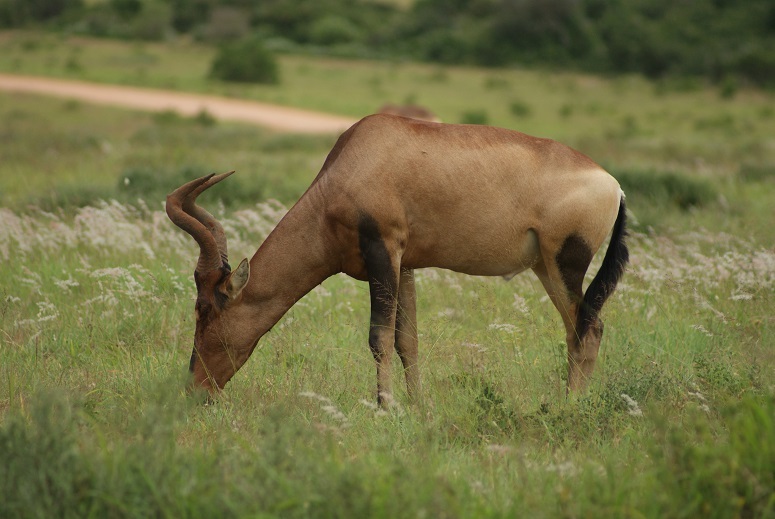 These animals are mostly active during the day, when they can be seen grazing on medium-height grass stands. 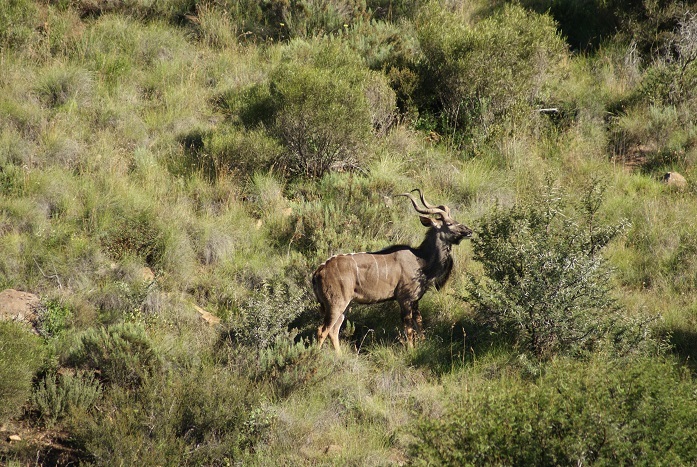 Mud is evident on these horns too. 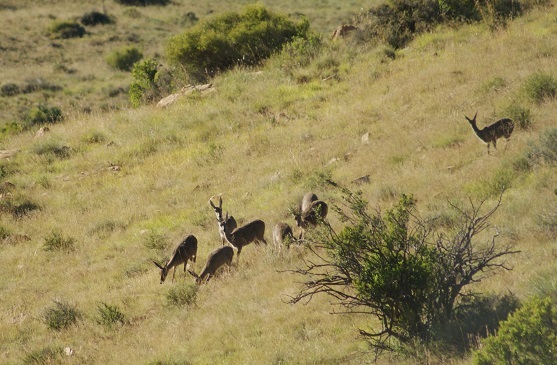 They do not have to drink water every day as long as there is sufficient moisture in the grass they eat. 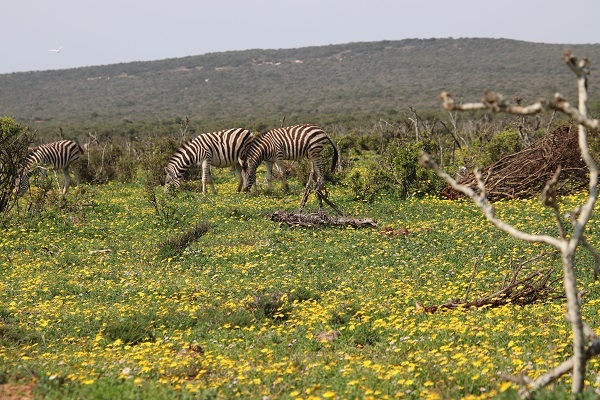 Nonetheless, here are some at Domkrag Waterhole in the Addo Elephant National Park. We were the only ones parked at Ghwarrie Dam. 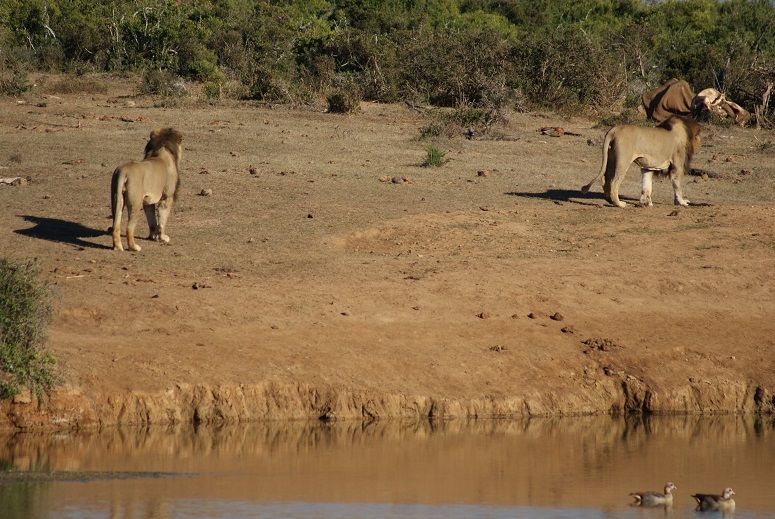 While watching the antics of the South African Shellducks, Egyptian Geese, and the Stilts, we looked up to see two male lions padding purposefully along the edge of the dam. Not a sound did they make. There was not even a flurry of concern from the birds. 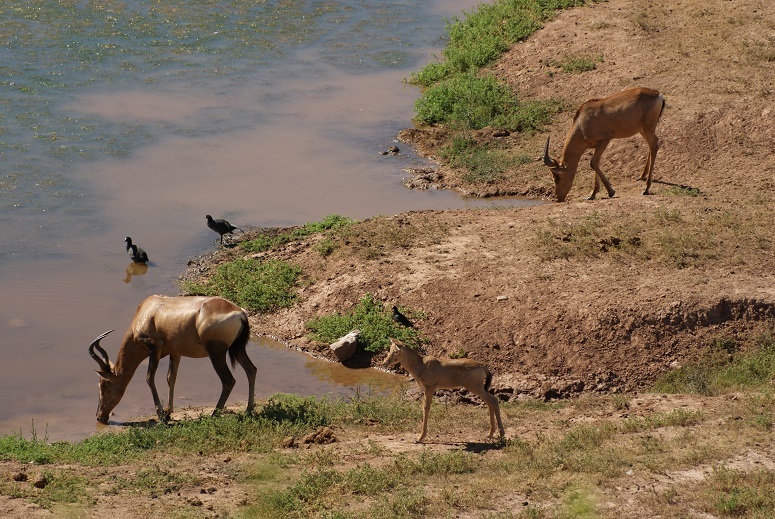 We watched in awe as one chose to walk along the edge of the water and the other a route a little further from the bank. 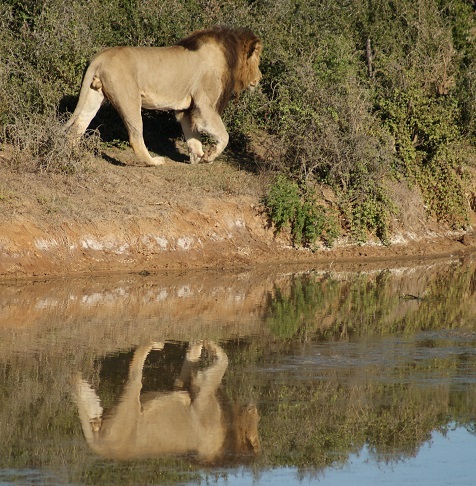 The two lions padded past an old elephant carcass without halting their stride – and disappeared. They had covered the distance in under two minutes. 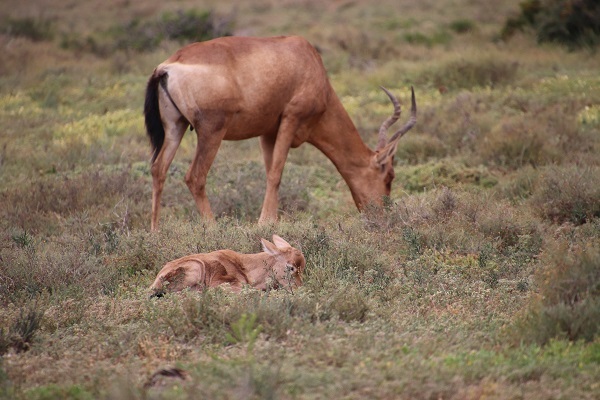 Game viewing depends so much on the good fortune of being in the right place at the right time. We were joined by another vehicle not a minute later. 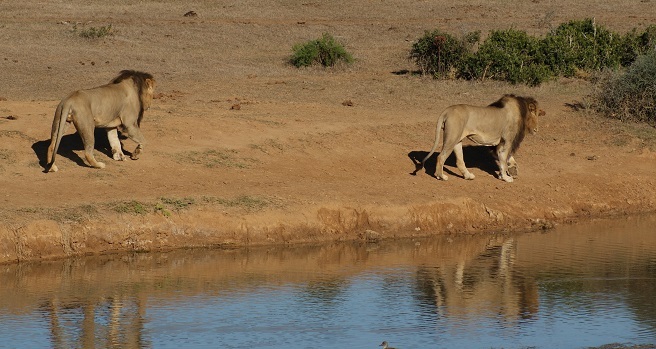 The occupants scanned the dam and asked hopefully, “Seen anything interesting here?” There was no chance of them seeing the lions. “You’re so lucky!” They pulled off to seek their own good fortune elsewhere. 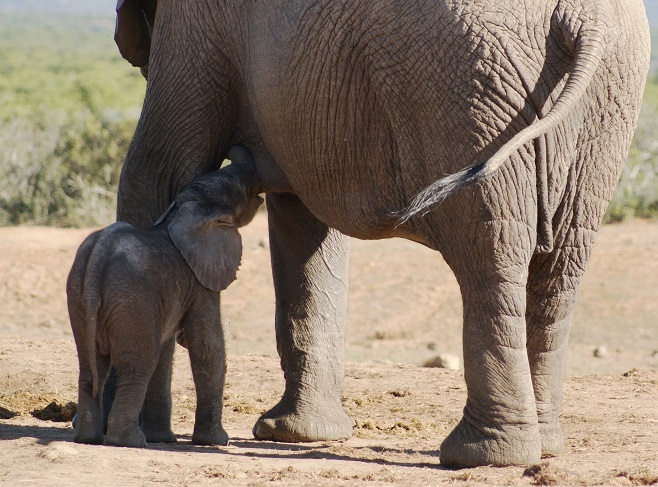 We later watched an elephant calf suckling its mother at the Spekboom waterhole. 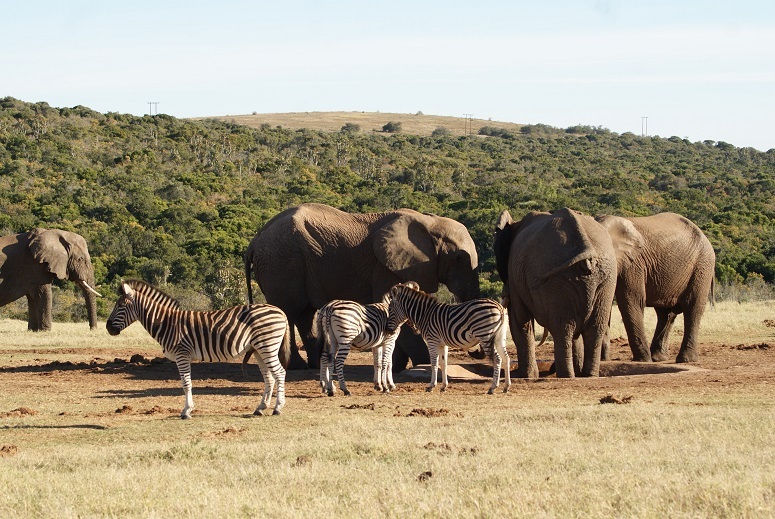 At what has become known as Windmill Dam, four zebra waited patiently for the elephants to drink their fill. 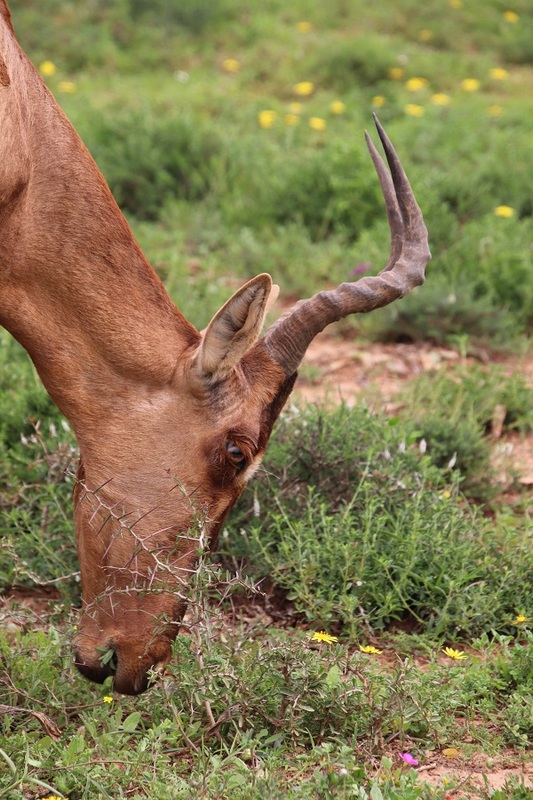 Further on, some red hartebeest nibbled at the dry grass. 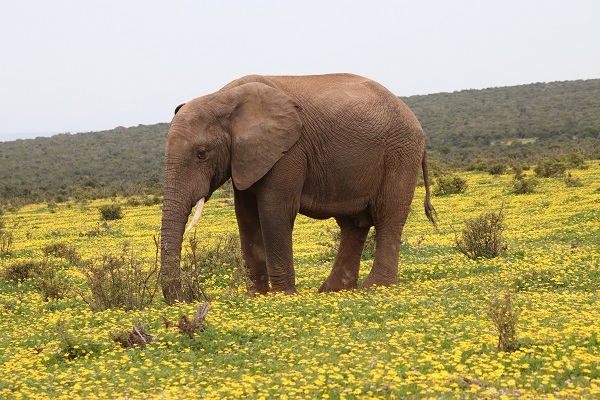 We decided to exit the Addo Elephant National Park via the Ngulube Loop. 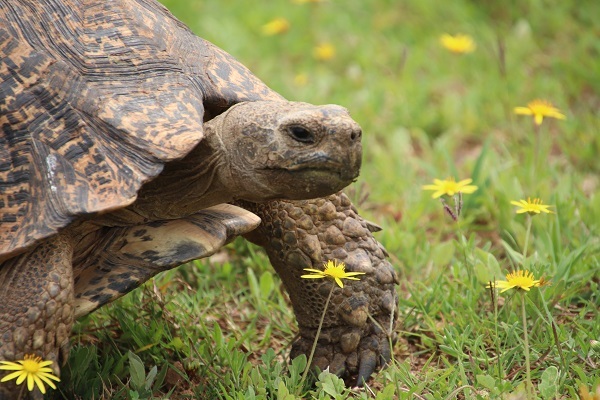 A low russet shape moving quickly through the long grass at the edge of the road caught our attention. 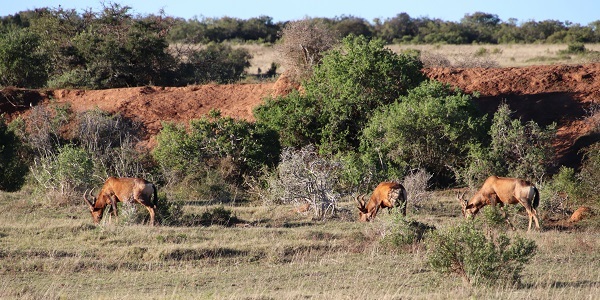 The movement was far too quick for me to focus my camera and so I simply enjoyed our good fortune at seeing the unmistakeable shape of a caracal emerging from the tangle of spiky shrubs and long grass and bound across the road in the mellow afternoon sunshine – my first sighting of one in the Park. 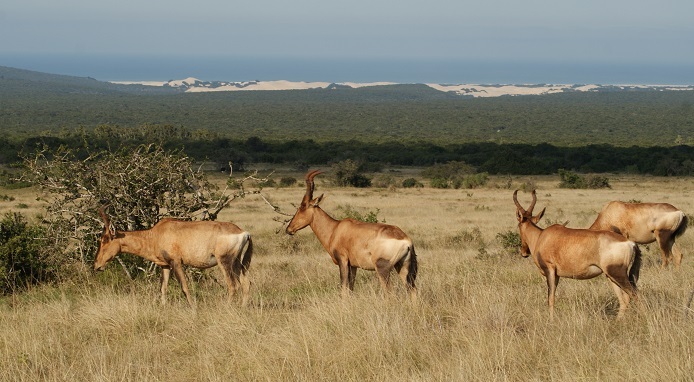 Good game viewing really can be the result of the luck of the draw sometimes!